Some of the wall murals in Zaachila. Please understand that I am new to Mexico, and this post is really truly just a reflection, made from my inadequate understanding of a celebration with many layers of significance and ritual. I am including a post about it because I was struck by how deeply preparing food and eating communally is woven into the fabric of celebration within the many cultures here in Mexico. Día de los Muertos (Day of the Dead) is a celebration and communion with ones ancestors and loved ones that have left this world. It seems designed to bring colour and light to the shadows of soul as well as buildings homes and graveyards, in the most artistic and dramatic manner. Oh, and did I mention that food is at the centre of all this too?! The smell of sweet breads and mole was everywhere. 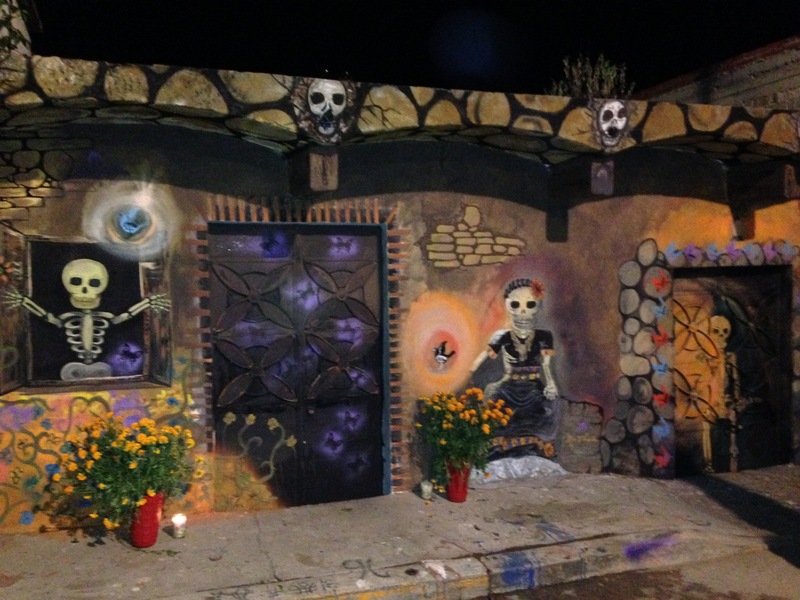 Alters constructed both publicly and privately to honour the dead, are adorned with oranges, beer, mezcal, bread encrusted with candy skulls, tamales, and chocolate…oh the chocolate…and flowers. Mountains of flowers. There is a soft mix of smells everywhere. This is both a very private celebration within churches, homes, and kitchens, but it is also very public and shared within streets and cemeteries. 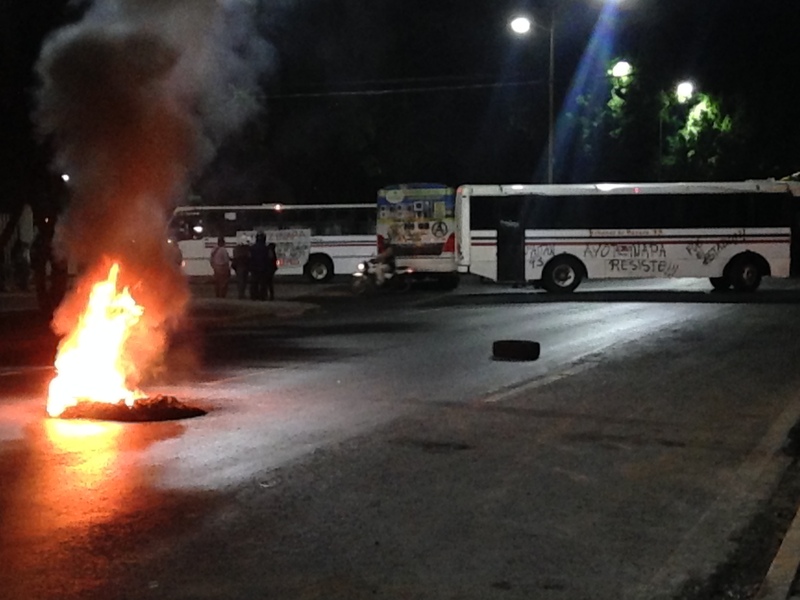 A blockade expressing anger for the 43 disappeared students. Characteristically a joyful acceptance of the cycles of life, this years celebration also included expressions of palpable rage that threw light onto the shadow of the 43 students that disappeared at the hands of state forces in September. These students were remembered very publicly. Not declared dead and therefore not to be mourned in the way of the dead, but the pain of their loss brought clearly into the actions of everyone and everything passing. On the eve of the Day of the Dead I arrived in Oaxaca City, which is renowned for many things including its celebration of this festival. I tagged along with a group of university students, one of whom had invited us to experience and engage in this beautiful celebration on the land of his childhood home. Now vacant, this house became our communal space of rest, conversation, laughter, and of course cooking. I was honoured to be invited into the public and private spaces of this celebration by people proud to share their culture. On the Day of the Dead our group travelled to a neighbouring village, Zaachila, known for its veneration of their ancestors through celebration and art. 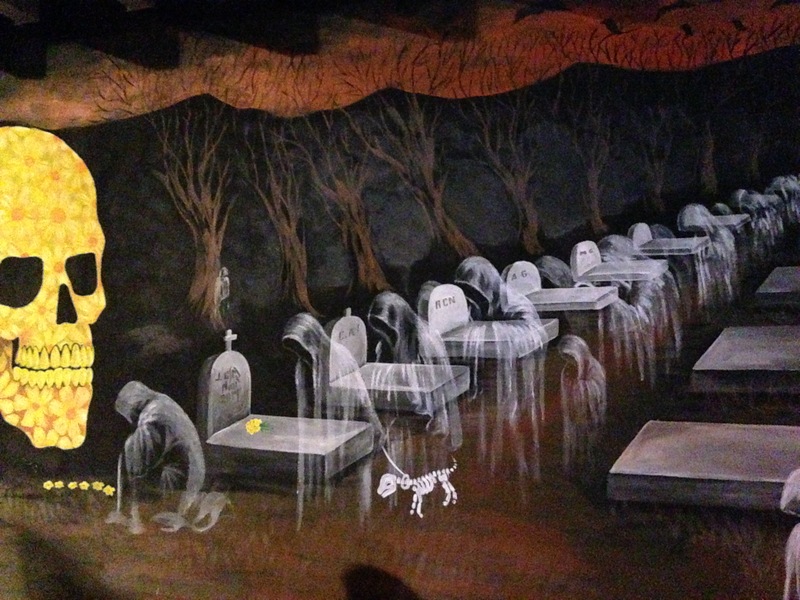 Annually, the walls of the town are converted into murals…folding into one another, there is no space that isn’t included in the elaborate and magnificent shades of death and mourning depicted on the walls. There was also a children’s art show, live music, a carnival, a parade, and of course food everywhere. 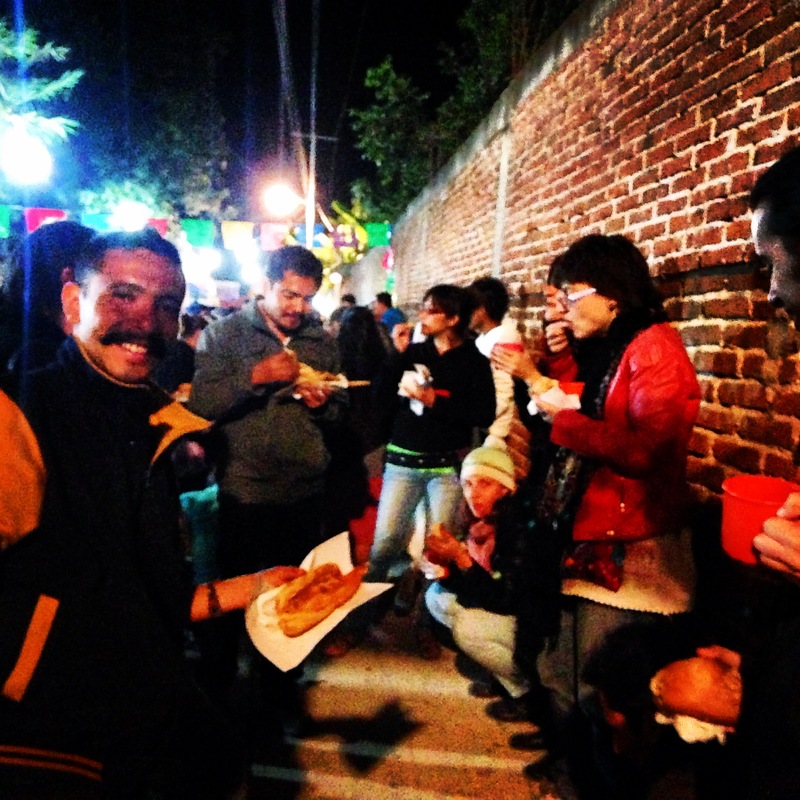 As we meandered through the streets we stopped at one of the many stations that were serving hot chocolate, tamales and sweet bread. These stations clearly powered by the community itself, a mix of women and families, young children running to a fro in total jubilation to be of service. And it is all free. Eating together at one of the many free food stations. Everyone eating keeps the dead happy! One can only imagine the time and energy that goes into preparing the food for such large scale festivals, and as I was to come to understand soon, it is only because of the highly practiced skills of mutual aid amongst community members that any of it is possible.